I am now getting quite a collection of Robin's books. All of them go into great detail on how to use the software or help you to be a better photographer. When using topaz software or even Nik software it is quite easy to just jump in and play with no real direction and purpose, in attempts to create that killer image. Robin encourages you to slow down and consider what you want to achieve and how to go about it the right way. It is surprising how the small controls within the software really count and how easily you can be over zealous at first. For the price of little more than a coffee you can improve your photography by buying any of Robin's books. Thoroughly recommended for Topaz Detail users even if you think you know what all the controls are capable of. Sample images you can download from the author’s website to follow along with the book. Online video tutorials to supplement the text of the book and see further worked examples. 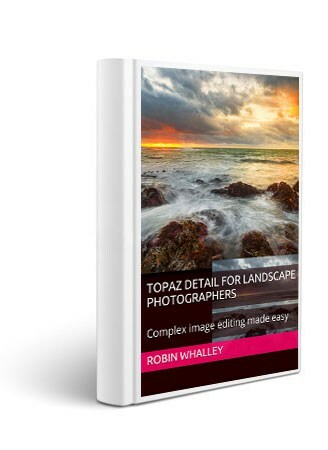 A discount coupon code to use when purchasing Topaz Detail if don't already own a license.